My hive mate requested a very scrappy block for February. I dove into my scrap bin and started cutting and placing 2-inch squares on my design wall. When I made it through the bin I was pleased when I had just enough different fabrics to complete a block! I had a bit fewer options for the white on white corners, so there is a repeat in there. We received 5 inches of snow at my home on Sunday, and I just couldn’t resist taking the block out to see how it looked against the fresh white snow. This is a great block for a bee and a wonderful way to see a large smattering of fabrics. For the tutorial and a view of how the quilt comes together based on a previous bee, please visit the Stash Bee Hive 9 February Tutorial. tiny squares but fun to see what meticulous cutting you can get in there – a nice choice for a bee block. That turns out really well with the different colors – very fun. And using up scraps is such a fine idea!!! I just got rid of some and now I have more – ugh. The “pile” up way too fast. Beautiful block, lots of bright colors. I love how the little yellow butterfly is just floating in it’s block. What a great scrappy block! 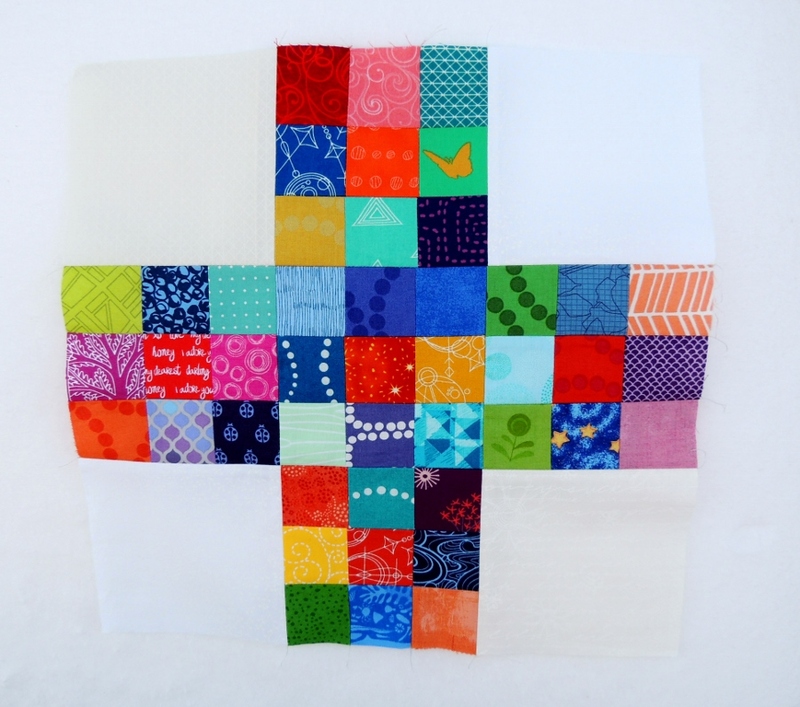 I can ‘see’ many of your quilts by looking at your block! What a fun block! So simple yet it’s so colorful and happy. I love how it turns out all together too, so much scrappiness. 🙂 Thanks for sharing the link to the tutorial! that block looks great. I would be so afraid with all those tiny pieces my seams wouldn’t match up, but you did great. Good Morning Yvonne! I have to tell you that I am very impressed with this block! I visited the site and looked around at quite a few of the tutorials and variety of blocks that have been created; what a fun and excellent way of breaking down the stash. The tutorial for this block is written wonderfully and I know after seeing the picture of the quilt with all of the blocks, I will be making this quilt for positive. So thank you so much for sharing this remarkable and new (to me) block/quilt. Have a fantastic creative day! 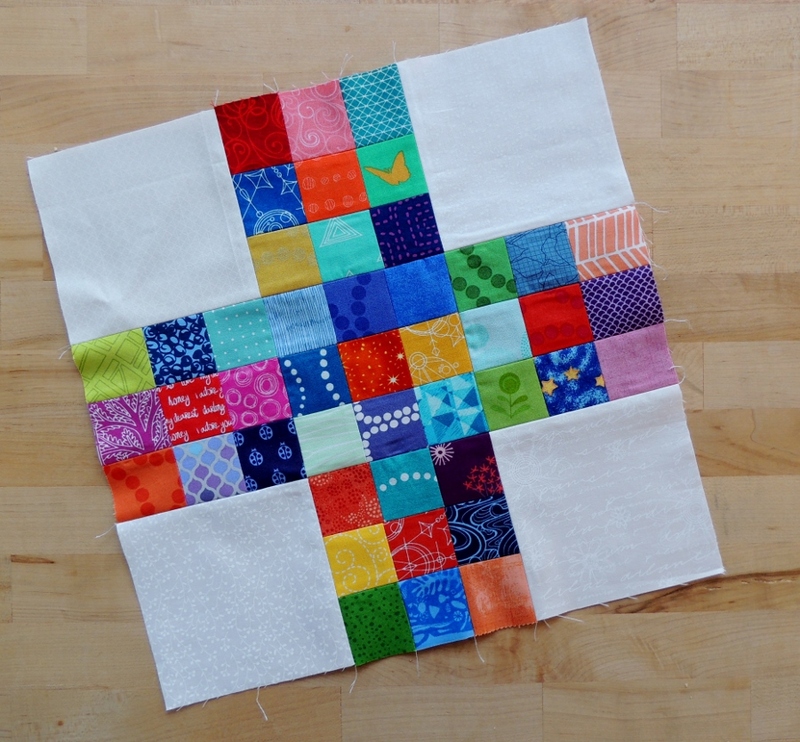 The really bright colors in this block are a lot of fun, and I really like the quilt that can be made from these blocks. What? Five inches of snow! Don’t you live on the West Coast? Here in Maine we haven’t had a foot of snow yet this winter, and it’s going to be 50 degrees tomorrow. No climate change, right? All of your squares are so bright and fun! That’s awesome you guys got 5″ of snow! By the time the storm got here all we got from it was a heavy dusting that melted within an hour. Pretty block. I love looking at this sort of quilting and spotting all the different fabrics. Very pretty block! I’m thinking I’d have to repeat the white on white print too, white is not something I use a lot in my quilts. I cut my scraps into squares for a one-day project just like this one. It is such an effective scrap block. Snow? I am a little bit envious. We are about to have a record-breaking heatwave of the kind that kills small children and the elderly: five consecutive days well over your 100F. Not good. Such a cheerful block. I grumble about the snow, but the moisture is a blessing.